“How Are You?” is a common question we use to engage with another person when we meet on the street, at work, in school or at family gatherings. 1. How are you feeling? Seriously, how is your body? How is your mind? Are you experiencing any symptoms on a recurring basis such as neck or back pain, headaches, stomach or other digestive disturbances, tension or stress? These symptoms are indicators that there may be imbalances in your body that need to be addressed. How are you addressing them? Are you masking these symptoms with medications or are you eliminating the underlying cause? Getting to the cause is a much better plan. This leads to the next question. 2. How are you functioning? If your body is functioning properly then you have the opportunity to feel healthier most of the time and also perform at your highest level. Your body can heal itself from symptoms and conditions and you will be adaptable to the stresses in the world. 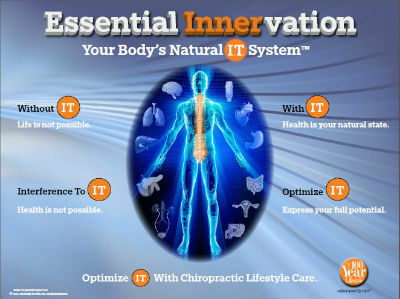 Your nervous system is the master control system of your body and must be healthy for you to function properly. Recent research has revealed that neuro reflexes support homeostasis, which is body balance, by modulating the function of organ systems and regulating the immune system.1 Many of our patients report that the chiropractic care we provide helps their body eliminate recurring symptoms while it functions at much higher levels. When you make Function a priority over Feeling, you will appreciate a greater level of health and vitality every day. 3. How are you living? Is your lifestyle supporting you in function and feeling at your highest level for a lifetime? If not, you may be headed for a roller coaster ride of deterioration that could last for decades. Through The 100 Year Lifestyle education and chiropractic care we provide, you and your loved ones will be able to answer the “How are you?” question with gusto! and enjoy the long, healthy, quality of life you deserve.